I remember my uncle keeping these fine birds when I was a boy, and how their unusual regal quality would grab my fleeting attention as I tore past them in pursuit of my cousin. Now, as a chef I appreciate them all the more. Guinea fowl is delicious and underrated – it roasts superbly, as well as chicken and better than pheasant. Remove the birds from the fridge about an hour before cooking so they come up to room temperature. Preheat oven to 200°C. To make the black pudding stuffing, peel, core and dice the apple. Remove the black pudding from its skin. Crumble into a mixing bowl. Combine with half the chopped sage, the soft butter and the diced apple. Mix well. If the birds are trussed, cut the strings and remove. Place the birds in a large roasting dish. Pull the legs and wings away from the body a little so hot air can circulate. Carefully lift the skin that covers the breasts at the front of the bird – it should run down into the neck area. fill the breast cavities with the stuffing (be careful not to tear the skin and try not to overfill the birds). fold the skin back, tucking it under and tidying it up a bit. Trickle the olive oil over the birds and season them generously with salt, pepper and the remaining chopped sage. Put the fowl in the oven for 25 mins, then remove and baste the birds. Reduce the oven to 180°C and return to the oven. Cook for a further 40-50 mins (if you have a very small guinea fowl of only 1kg or so, 30 mins should do it). Check that the bird is cooked by sticking a skewer into the thickest part of the meat, where the leg joins the body – the juices that run out should be clear. If there’s blood, the meat isn’t cooked: return it to the oven. When nicely cooked, rest for 10-15 mins in a warm place before serving. Serve slices of the guinea fowl with the rich black pudding and apple stuffing, and some cider gravy. 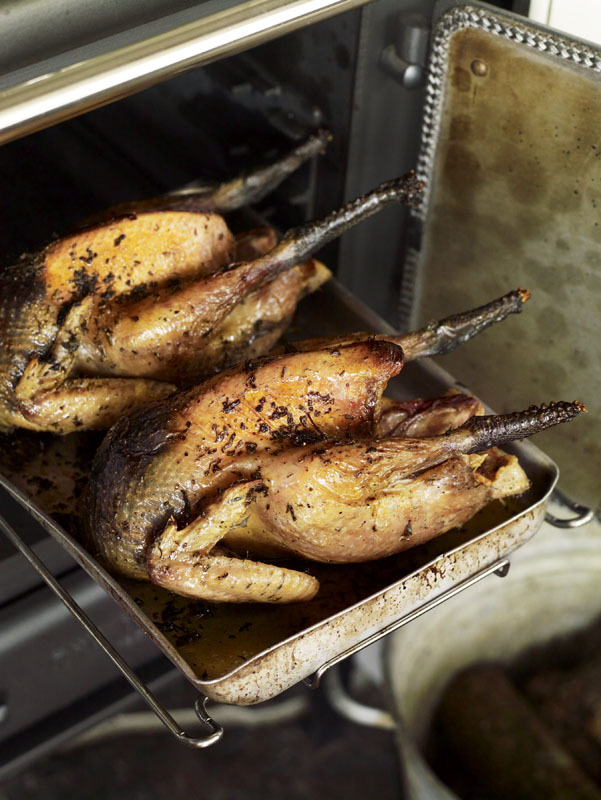 To make a simple gravy add 1 tbsp flour to the roasting tin juices from the guinea fowl and combine to a loose roux. Cook this over a gentle heat for 1-2 mins. Pour in cider and chicken or beef stock along with a spoonful of red currant jelly. use a whisk to bring this together as it comes up to the boil. Simmer for 2-3 mins, season and pass through a sieve.